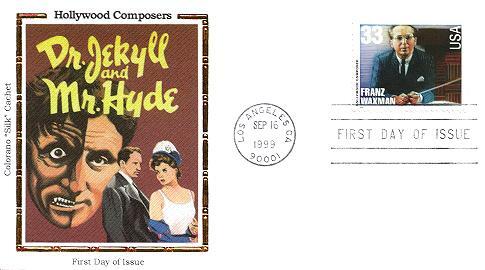 Franz Waxman wrote the musical score for the 1941 screen rendition of Robert Louis Stevenson's Dr. Jekyll and Mr. Hyde. The cachet depicts Spencer Tracy as the troubled schizophrenic and the doomed "bar woman" he pursued. Superimposed above the pair is a depiction of Tracy's split personality  the lovable, meek Dr. Jekyll and the utterly sadistic and diabolical Mr. Hyde. Tracy was hailed for his role. Six distinguished composers, each of whom made outstanding contributions to the world of music and entertainment, were recently commemorated by the U.S. 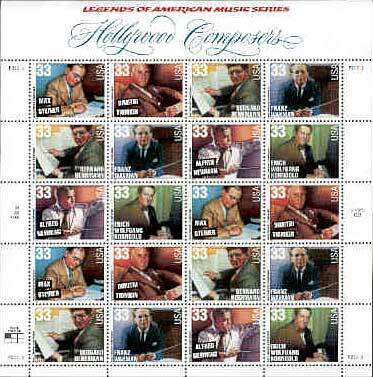 Postal Service with the issuance of the Hollywood Composers stamps. 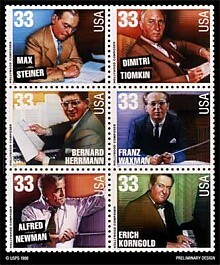 Max Steiner, Dimitri Tiomkin, Alfred Newman, Bernard Herrmann, Franz Waxman, and Erich Wolfgang Korngold are featured on the pane of six 33-cent stamps. The stamps, which were designed by veteran stamp art director Howard Paine of Delaplane VA and illustrated by Drew Struzan of Pasadena CA, are now available nationwide. 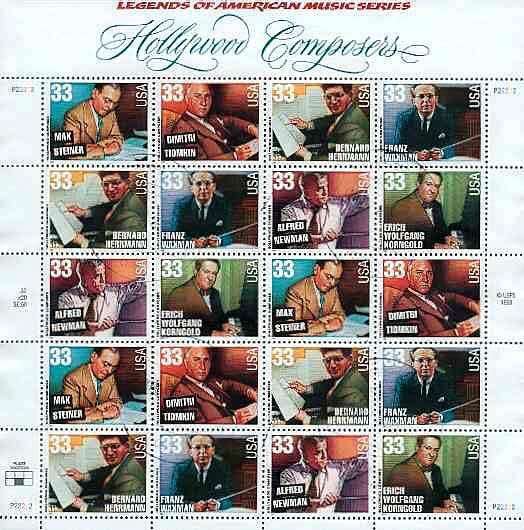 The Hollywood Bowl Orchestra, conducted by John Mauceri, performed a musical tribute during the event, playing songs by each of the composers honored on the stamps.